Marmoleum is a brand of linoleum, a man made material which was invented, patented and first manufactured in Scotland in the 1800's. It is produced out of raw materials such as linseed oil, pine resins, wood flour, clays and chalks, which are pressed onto a jute backing. It is manufactured in the same locations in Holland and Scotland since the early years, and in 1872 first plant was built in the United States. Linoleum is more expensive than vinyl flooring, but it is thought to be better tolerated by people with allergies, and is now produced in many attractive colours. Marmoleum is most widely used for commercial projects - you might have seen it in some hospitals, with perfectly laid floors displaying beautiful inlays of floral and geometrically shaped patterns. 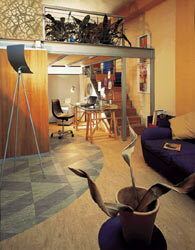 Such type of flooring is ideally suited to large, open spaces of lofts. If you rather had a softer, warmer flooring surface than polished concrete, Marmoleum might be a very good option to consider. When installing linoleum, it is extremely important to use experienced installers. Linoleum has to be cut with sharp knives, and requires skill, especially when introducing inlays and borders. 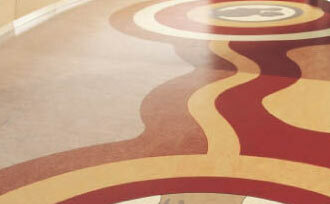 After installation is completed it is necessary to protect it with a wax solution which is mopped onto the floor. Afterwards it can be cleaned with soap and water. If cared for properly, real linoleum can last a lifetime. It is, therefore, important to have the installation done right. For Marmoleum sales and information in the Greater Toronto Area please contact Forbo Linoleum Inc. at 416.661.2351 or by e-mail at info@fl.na.com.